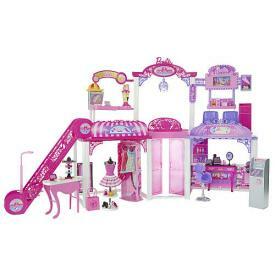 My Family Fun - Barbie Shopping Mall Playset Shop with Barbie and her friends at the Malibu Mall! Shop with Barbie and her friends at the Malibu Mall! There are always fashionable finds, fabulous fun and "amazing" adventures to be had. •Slide a smartphone inside the theater to watch your favorite film (smartphone not included)!